Since the release of the first draft of the Next Generation Science Standards (NGSS), NSTA has been at the forefront in promoting the standards and helping science educators become familiar with and learn to navigate this exciting but complex document. Later, when the final version was released and states began adopting the standards, NSTA started to develop resources that would assist educators with their implementation. •	matrices showing how the NGSS are organized by topic and disciplinary core idea. This guide also provides the appropriate performance expectations; disciplinary core ideas; practices; crosscutting concepts; connections to engineering, technology, and applications of science; and connections to nature of science. It is designed to be used with the NGSS. The book’s emphasis is on easy. Find the parts of the standards most relevant to you, acquaint yourself with the format, and find out what each of the different parts means. 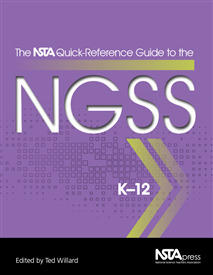 The NSTA Quick-Reference Guides to the NGSS are also available in grade-specific versions—one each for elementary, middle, and high school. These Quick-Reference Guides are indispensable to science teachers at all levels, as well as to administrators, curriculum developers, and teacher educators. Any one of these volumes are a must have for classroom teachers, curriculum supervisors and/or administrators. Information provided in these volumes definitely demystifies what might be described as a very confusing document. A very well organized tool to have as a desk copy while writing and revising curriculum. Well worth the purchase!